I don't recall a time when an automaker has consistently shot itself in the foot in the area of styling quite as much as Ford has lately. Among the company's strategic errors (see also: the slow intro of crossovers, the complete neglect of the sedan game for several years, and the painful deaths of both the once-most popular compact pickup in America and a once-decent minivan contender), Ford's chronic under-redesigning has been one of the most damaging decisions to its brands, especially the Blue Oval. Over the past few years, Ford has made dramatic improvements to almost its entire existing portfolio, while making every attempt to hide these improvements from the public. 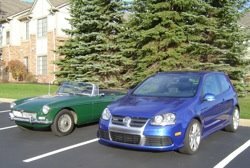 Having worked at one of its ad agencies, I was constantly forced to listen to ebullient engineers raving about the amazing leaps forward they'd made, in areas like ride comfort, engine efficiency and especially NVH (noise, vibration and harshness for the uninitiated), while wondering if anyone at all would actually realize the vehicle had been touched. It started with the '06 Explorer redo, which is probably the best example of this trend, but continued with the Expedition, Escape, Super Duty and the E-Series van, as well as the transformation of the Five Hundred and Freestyle into the Taurus and Taurus X. The Focus is a bit of a different story. While you can certainly tell that it went under the knife beyond simple fascia work, the results are more along the lines of Michael Jackson than Ashlee Simpson. It's a damn shame that the hard work of so many great engineers is being almost completely invalidated by sloppy management of the design studio. Other carmakers may be strapped for cash (see: GM and Chrysler) but they know how to make a redesign count.